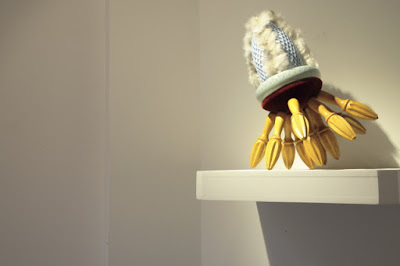 frillip moolog - Blog :: frillip moolog blog: Close Encounters of a Frillip Moolog Kind. Were the streets of London paved with gold? Close Encounters of a Frillip Moolog Kind. Were the streets of London paved with gold? What a journey! I’m only now writing about Close Eencounters of a Frillip Moolog Kind as I have been so busy living it! The beautiful documentation photographs were taken by Olwen Holland. Olwen mentioned how the older beings such as Hyacinth and Tall Legs seem to show the same personality traits whether they are at home or “on location” as they seemed to be in Notting Hill. Hyacinth seems to be taking on the role of Grande Dame of Frillip Moolog. Sydney Levinson is taking liberties tickling her grassy underside. Momtaz was a lady in red alongside a lady in red. Suse (the first to own a Frillip Moolog being) was whispering a few secrets into her ear. I was just having fun in my Private View evening wear. Notice the lining of the 1970’s crochet dress is the same fabric as Ziggy’s “skin”. Westbourne Grove Church Artspace is a truly unique place to exhibit and within a day I felt welcomed into the Artspace family. I spent quite a bit of time there over the 6 weeks of the show and every time I pushed open the glass door I felt like I was coming into a strange extension of my own living room. It felt like home from home; possibly because I knew the beings were enjoying being there so much? They certainly had a lot of attention with a huge variety of people using the building every day: Baby singing classes, Drama for Children, The Twelve Step Group, Brazilian Capioera classes, International YWAM groups, Home Educating Family Groups; all sorts of people from very wealthy to those a lot less well off, from very young to older people, people who had never visited the space before to some who spend time there almost every day. There were people who visited specially to see Close Encounters of a Frillip Moolog Kind to people who were enticed in from the street to find out what these “strange and colourful flying creations” were. I had all sorts which is exactly what I wanted. I got people who went away and then returned for a second time. I had children wide eyed with wonder and I had adults wide eyed with surprise, amusement and happiness. It didn’t take long before the staff at the Artspace started to observe that the reaction, whatever the age of person, was the same; and the show started to be described as being joyous and uplifting. The period of the show while in Notting Hill meant that I could get out to more exhibitions and galleries in London (spreading the word about Frillip Moolog) and encouraging people to visit the show to see the beings in the flesh. Ian Fitzpatrick aquanting himself with Tall Leg's sensual textures. Not my balloons but a young person's party in the building. The beings joined in! "Is that real gold?" One of the young Capioera pupils enquired about Andrew Logan's smiley brooch. ( one of his own). As you know I am a big fan of Andrew’s so I felt very honoured that he took time to visit the show, have a cup of tea and get aquanted with the beings. Liz Cooper, one of the curators from Bury St Edmunds Art Gallery’s, response was, “It’s magnificent!” And I was so pleased to be able to explain more through my Artist Talk which Georgia Newman, Exhibitions Organiser at Quay Arts, Isle of Wight, came especially for. Some people still couldn’t make it over to Notting Hill so with the help of Karoline Newman I went to them. It was a real privilege to be able to do a one to one presentation for Beth Smith at Selvedge magazine. As I said, the Artspace team began to feel like family. When we first suspended Ziggy, Angie, Russell, Celeine and Stan (my first non floor based beings) they were there with the scaffold tower and were fantastic at advising while also ensuring that I felt ownership of the show. I felt supported and also empowered. They helped to organize a group of home educated children so that I was able to run a day long workshop which complemented Close encounters of a Frillip Moolog kind. 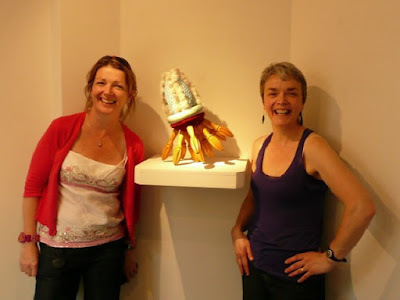 Laura and Susan ensured that the private view really was a party and gave technical support for my Artist Talk. But most amazing for me is that they were there when, as we were packing the beings up at the end of the show, a collector who had been admiring Bettina over the previous 24 hours, came back to buy her! My sister, Sandra, and I with Bettina. This is two weeks before we knew she was off to pastures new. The opening event at venue 2, Solihull Arts Complex, is 22nd October and the show runs until 14th November. Another great opportunity to have an audience with the beings and to find out more about the world of Frillip Moolog. Wow, looks and sounds like it was fantastic!! Look forward to seeing it in Solihull next week but i have to say would have loved to have seen it in the westgrove church artspace - looks like a great space to use. I'm in the process of applying for funding and looking for a venue to put on a solo show of my own (would be first one) so I may look into the church artspace! Great post Kirsty. I am so happy for you to have sold 2 friends. It was a pleasure to meet you and see the show. Do you miss them after they're bought? Hi Kirsty, I did like you exhibition. Sorry if it did not appear that way in my blog. I've removed the entry. Maybe I dodn't express it well, Good Luck. I was delighted that you'd written about it! What did I say? I’m ever so sorry I thought that I’d said that. Really it made my day! Hi Kirsty, Slight misunderstanding on my part. Enjoyed the exhibition. I often pop up to look what is one at the arts centre as I work some times in Solihull and that is the first exhibition up there I have connected with.